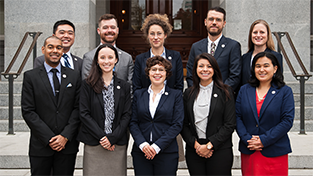 Ten PhD scientists have taken the leap from the lab bench, field station, and computer desk to explore a year of public service and government leadership training in Sacramento, working as legislative staff in the California State Legislature in 2019. 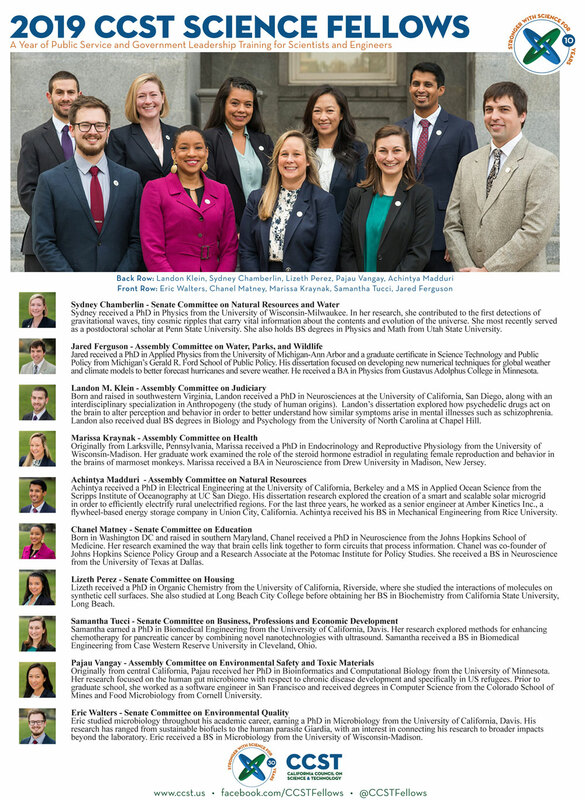 We are proud to introduce to you the 2019 Class of our CCST Science & Technology Policy Fellowship — a program that trains scientists and engineers for careers in public policy, while helping to equip California’s lawmakers with science-savvy staff. 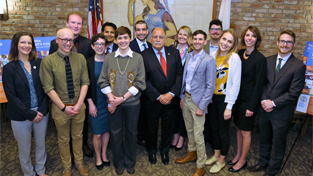 Our 2019 CCST Science Fellows have conducted research at the likes of UC Berkeley, UC Davis, UC Riverside, UC San Diego, University of Wisconsin-Milwaukee, University of Michigan-Ann Arbor, University of Wisconsin-Madison, Johns Hopkins School of Medicine, and University of Minnesota, and their technical expertise spans fields including gravitational waves, microbiology, bioinformatics, global climate modeling, neuroscience, energy storage, reproductive health, organic chemistry, and biomedical engineering. These ten PhD scientists reported to our downtown Sacramento headquarters last November, to participate in our annual “policy boot camp” — a crash course on the process, history, and landscape of California policymaking, as well as skills development and communications workshops to prepare them for the intense, dynamic pace of the Capitol policy world.